Amongst the countless reasons you could have for visiting Japan, it’s easy to forget that it’s also one of the most exhilarating skiing and snowboarding destinations on the planet. While summer’s great in Australia, there is such a thing as too much sun – so why not escape the blinding heat with a dose of the polar opposite: magical sub-zero air, glorious onsens, and some of the world’s softest powder amidst the dramatic high altitudes of Japan’s best peaks? Today, we’re chilling you out with the ultimate Japan snowfield bucket list. With excellent side-country skiing, an average 1270cm of snowfall every season, and a whole lot to explore in the nearby regions, Rusutsu is the snowfield that keeps giving. 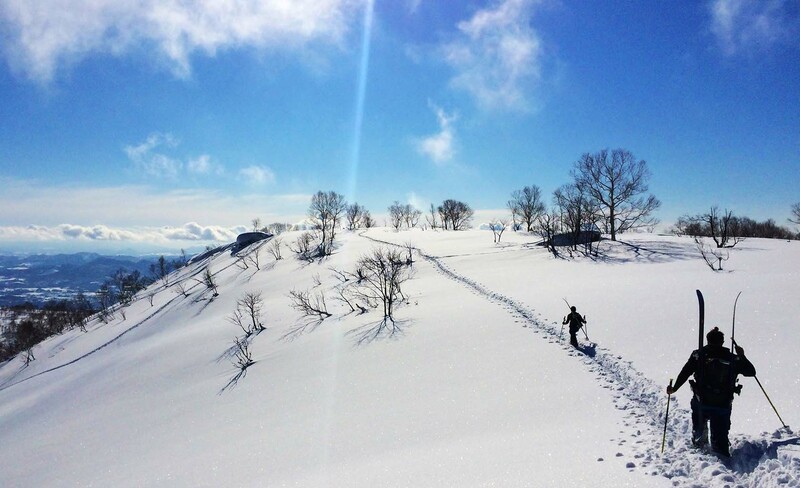 Located just two hours from Hokkaido’s Chitose Airport, this is a perennial must among local and international skiers alike for its diverse trails and all-round awesome experience. Less party and nightlife hub, more purists’ choice, this decidedly less busy hub is for those who love to ski and board in style, without the congestion of other prime spots. Located on northern Hokkaido by the imposing dormant Mt Yotei, Niseko is a leading choice for local powder buffs. Expect a slightly more crowded scene compared with neighbouring Rusutsu. With its international village vibe, there’s heaps more going on in the way of extra-curricular activity after dark, so party animals and night skiers will be well satiated. Add to that an abundance of budget accommodation and hostels, which are uncommon at other Japanese ski resorts. Still, the big selling point of Niseko is its lush 38 to 45cm of seasonal powder – that, and its exceptional backcountry terrain and awesome downhill runs. If you’re the sort of skier or boarder (or straight up snow-lover) looking for a more authentic Japanese resort setting, Kiroro is your place. Known for its huge dumps and exceptional powder, Kiroro is another Hokkaido gem, offering varied terrain while catering to all experience levels from novice to expert. Excellent lifts and a decent smattering of restaurants, bars and onsens (Japanese hot-spring spas) make this an ideal and ultra-comfortable northern choice. Shiga Kogen is the big kahuna of Japanese snowfields. With over 19 interconnected resorts nestled in and around the region, it’s the largest and most diverse snowfield in the country, with an abundance of alpine villages to be discovered throughout the course of your stay. Check out Yakebitaiyama resort for the biggest range of slopes on the mountain, as well as the tallest and most scenic peak. Fancy yourself a black diamond bandit? You want steep? Sapporo Teine brings it. Though Japan’s ski fields aren’t particularly well-known for their angles, Sapporo Teine dishes up a range of sweet 38-degree pitch slopes. So, while there’s not a whole lot to say here for intermediates, experts will relish in the challenge, while newbies are well accommodated with a bunch of short, easy runs. All are neatly accessible just a 40-minute drive from Sapporo. Nestled on Mt Kenashi in the Nagao prefecture, Nozawa Onsen is one of the most-sought-after and reputable resorts in the country, largely thanks to its nourishing hot springs. This steamy hub, located amidst traditional Japanese ryokan inns and cobblestone lanes, is a historic hub too: widely considered the birthplace of skiing in Japan. Come for the powder, stay for the onsens. Perhaps best known for being a stop off on the FIS Alpine Ski World Cup circuit, Furano’s virtues are many: turbo powder, epic runs, and an all-out world-class setup fit for sensational slope action. Furano is also home to the Furano Ropeway: the fastest ski lift of its kind in Japan, which gives ultra-speedy access to abundant downhill goodness. Better still, the city of Furano is a short drive away, which means you can chill at a hotel at the base of the mountain and head up from there if the on-site options don’t float your boat. Zao Onsen is a sweet place, but it gets a special mention alone for its “snow monsters”. Snow monsters, you say? Fear not – we’re not talking yetis or abominable snowmen here. The hefty snowfall at this Yamagata prefecture resort coats the tall trees around here so immensely that locals took to calling them “monsters” a while back, and the name stuck. All in jest, of course – the sight of the thick-coated white tree-lines here are pretty magical. February is usually the best time to check them out. Book with Qantas for your next Japan adventure and enjoy an all-inclusive service on Australia’s favourite airline, with entertainment, refreshments and checked baggage on every Qantas flight.